Following the decision of the World Heritage Committee at its 26th session (June 2002), a Joint UNESCO-ICOMOS Reactive Monitoring Mission was organized to the property from 20 to 25 April 2003. The findings and recommendations of this Joint Mission will be reported at the time of the 27th session of the Committee. (a) Institutional requirements: The conservation challenges and potentials in Lhasa would benefit from a management and development agency to co-ordinate activities in Old Lhasa, which could be responsible for the management of Old Lhasa and the World Heritage properties. It is recommended that such an agency be established to raise and administer funds from national and international donors. (b) Conservation, planning and urban development: Taking into consideration the on-going processes of change and urban development, it is recommended that a review of the urban development plan is undertaken to ensure integrated territorial urban conservation challenges of Lhasa. The current conservation plan of 1995-2015 should be made available to the public to increase their appreciation of the plan. A mechanism to periodically review the relevance of the conservation plan should be built in the planning process itself. (c) Protection: In view of the rapid change in the character of Old Lhasa, all remaining historic traditional buildings in Lhasa should be protected at the level of the Autonomous Region or at the national level. (d) Conservation and rehabilitation of historic traditional buildings: Demolition should be stopped, particularly in the Shöl area. If in exceptional circumstances, demolition is necessary, any necessary replacement buildings should be in keeping with the historic character of the area. The State Party is requested to inform the World Heritage Committee of its policy on the conservation of the historic urban fabric of Lhasa. (e) Conservation awareness: It is recommended that the management authorities set up a programme to encourage community participation and increase awareness of heritage conservation needs amongst the local residents. (f) Protective areas and buffer zones: It is recommended that the management authorities evaluate and redefine the current World Heritage protective boundaries and management guidelines pertaining to the Potala Palace, Jokhang Temple (including the Barkor Historic Area) and Nobulingka, taking into consideration the heritage value of the surrounding landscape and environment. (g) Tourism: In view of the potential income generating opportunities from the tourism industry for financing conservation work in Lhasa, the heritage management authorities are encouraged to develop training activities and provide guidance on sustainable tourism planning at the World Heritage properties in Lhasa. (h) International outreach: An exchange programme between the World Heritage site managers in Lhasa and the managers of World Heritage properties in other countries is encouraged to develop on-property and international co-operation activities. The Chinese authorities may consider the organization of a study tour to successfully managed World Heritage properties focusing on the selected issues identified above;February 2004, on the measures taken and long-term development strategy proposed for the property in order that the World Heritage Committee can examine the state of conservation of the property at its 28th session in 2004. 9. Requests the State Party to take appropriate action to follow up on the findings and recommendations of the UNESCO-ICOMOS reactive monitoring missions in a concerted manner and to submit a progress report to the World Heritage by 1 February 2004, on the measures taken and long-term development strategy proposed for the property in order that the World Heritage Committee can examine the state of conservation of the property at its 28th session in 2004. Institutional requirements: The conservation challenges and potentials in Lhasa would benefit from a management and development agency to co-ordinate activities in Old Lhasa, which could be responsible for the management of Old Lhasa and the WH properties. It is recommended that such an agency be established to raise and administer funds from national and international donors. Conservation, planning and urban development: Taking into consideration the on-going processes of change and urban development, it is recommended that a review of the urban development plan is undertaken to address integrated territorial urban conservation challenges of Lhasa. The current conservation plan of 1995-2015 should be made available to the public to increase their appreciation of the plan. A mechanism to periodically review the relevance of the conservation plan should be built in the planning process itself. Protection: In view of the rapid change in the character of Old Lhasa, all remaining historic traditional buildings in Lhasa should be protected at the level of the Autonomous Region or at the national level. Demolition of historic traditional buildings: Allon-going demolition should be stopped including that to replace traditional construction in the Shöl area. Demolition of the traditional buildings and replacement with all-concrete construction should not be permitted to continue, and the State Party is requested to inform the World Heritage Committee of its policy on the conservation of the historic urban fabric of Lhasa. Conservation awareness: It is recommended that the management authorities set up a programme to encourage community participation and increase awareness of heritage conservation needs amongst the local residents. Protective areas and buffer zones: It is recommended that the management authorities evaluate and redefine the current World Heritage protective boundaries and management guidelines pertaining to the Potala Palace, Jokhang Temple (including the Barkor Historic Area) and Nobulingka, taking into consideration the heritage values of the surrounding landscape and environment. Tourism: In view of the potential income generation opportunities from the tourism industry for financing conservation work in Lhasa, the heritage management authorities are encouraged to develop training activities and provide guidance on sustainable tourism planning at the WH properties in Lhasa. International outreach: An exchange programme between the WH site managers in Lhasa and the managers of WH properties in other countries is encouraged to develop on-site and international co-operation activities. The Chinese authorities may consider the organization of a study tour to successfully managed WH properties focusing on the selected issues identified above. 5. Encourages the State Party to elaborate design guidelines for the built heritage environment, including urban design elements, so as to increase the capacity of local urban planners, architects, and designers to follow World Heritage conservation guidelines. 6. Further encourages the Chinese authorities to develop an articulated strategic programme for the restoration and renovation of the historic fabric of Old Lhasa based upon an analysis of the heritage values of the historic structures. This analysis should assist the authorities in ranking the buildings according to their importance. Therefore, the information should be made public. The Lhasa Municipality of the Tibetan Autonomous Region is therefore invited to provide information about all the conservation and renovation work in Lhasa to the World Heritage Committee. 7. 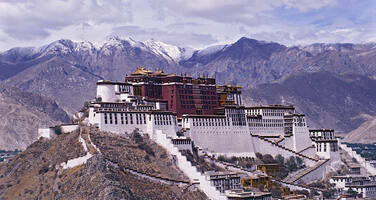 Requests UNESCO and ICOMOS to assist the Chinese authorities in the assessment and updating of the comprehensive conservation plan to make the most appropriate use of the Shöl Area, which forms part of the administrative section of the Potala Palace so as to maintain the traditional urban fabric of the area while changing the use of the traditional buildings. 8. Expresses its readiness to consider an international assistance request to support national and local efforts to address the above recommendations. .
9. Requests the State Party to take appropriate action to follow up the findings and recommendations of the UNESCO-ICOMOS Reactive Monitoring missions in a concerted manner and to submit a progress report by 1 February 2004, on the measures taken and long-term development strategy proposed for the property, for examination by the Committee at its 28th session in 2004.